The Laser X Long Range Blaster is one of the most popular laser tag guns in recent memory. You’ll find them in Walmarts all over America and in many other superstores internationally, too. 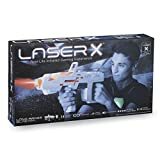 But is the Laser X as good as it’s made out to be, or are there other laser tag sets that are better options? There’s a good reason that Laser X are one of the most popular brands to come out in recent years – their products are pretty good quality for what they are. Whilst there are a few other brands that are close like Dynasty and Armogear, Laser X surpass them in terms of sales (thought this doesn’t necessarily mean quality). There are some main features of the Laser X Long Range Blaster that separate it from other laser tag guns. 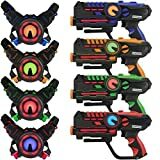 Though for the most part the majority of laser tag guns are the same, there are usually some differences between them that might make a certain brand more attractive for you. The design of the Long Range Blaster is completely different to the Fusion blasters, or any other blasters made by Laser X. It takes your standard three AAA batteries, which is pretty common for a laser gun. The reload is situated on the bottom of the gun and it’s really straightforward to use. You don’t need to worry if you’ve got young kids that are going to be using this gun – they’ll be able to understand it pretty easily. The trigger for the gun is also part of the handle, so it’s very easy to fire the gun too. The reload will give you 25 shots before you have to reload again. Another cool thing about this laser tag gun is that though the majority of laser tag guns are single fire, you can actually use this on automatic fire. It fires at a pretty steady rate, and you’ll probably unload your full clip in around 10 seconds. Another cool thing about this gun is that it actually has an illuminated firing range on top of the gun. This makes it easy to aim – to be honest, it’s more of a fun aspect than anything else but it is accurate over long distances. Overall, the Laser X has pretty much everything that you could ask for from a laser tag gun. Next, lets look at the good and bad things about this gun. Looking at the Laser X Gun, there are some good things about it – but there are also some things that I dislike about the gun. I’ll run through the pros and cons of this gun, and whether you should consider it as your choice of laser tag gun. Super long range – The majority of laser tag sets aren’t particularly long range – they usually have a range of around 100 feet. This set has a range of almost 400 feet and when Laser X say that, they actually mean it. Well made – The long range blaster is extremely well made, and you won’t need to worry about it breaking if you drop it. This can be a problem with cheaper laser tag sets – they can break before you even get them home! Easy to use with other Laser X products – Many families already have some Laser X products in their household. It’s really easy to use the Long Range Blaster with your other Laser X guns – though it may give you an advantage if you’re playing against the Fusion guns. A bit expensive – Although it seems cheap, if you want to get 4 of these guns the cost will actually add up dramatically. Individually they are a pretty good price, but if you need several of them then they’re definitely a bit expensive. Eats batteries – Most laser tag sets eat a lot of batteries, but the Laser X uses a little more battery power than other sets around. Be prepared to use a rechargeable battery set with your laser tag sets, otherwise you might end up spending a fortune on batteries! Can’t turn the volume off – Like with every other Laser X gun, you can’t turn the sound off! It can get a little annoying after a while, especially if the kids want to keep playing late. Laser X is a big brand – it isn’t just their guns that they’ve built their reputation on. There are a range of other products that they sell. The most popular of these is likely the Laser X Tower, which is an awesome laser tag extra that a lot of kids enjoy playing with. The good thing about the Laser Tower is that it gives kids the opportunity to play on their own. One of the only problems of playing laser tag is that you need 2 or people to play it to have fun. By getting extras like the Laser X Tower, this enables only children to actually have something to do when you don’t want to play with them. It has 8 different game types that you can use with it, including capture the flag which can undoubtedly make playing laser tag more fun. There are other ways to play capture the flag without purchasing something specifically to help you play. There’s also the Laser X Fusion Kit, which is very similar to the long range blasters except well.. they’re not long range. They work in a similar way, and you can actually use them together if you wanted to play with a larger group of people. 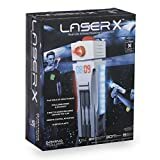 Overall, the Laser X Long Range Blaster is an awesome option if you want to get a good laser tag set that you can use with your family. Your best bet is to buy more than one of these guns so you can use them together – it really doesn’t make sense that you purchase just one! Overall, there are other laser tag sets available but the Laser X is one of the better options that you can get to entertain yourself and your kids. Really? Maybe it’s an issue with the batteries I’ve been using then, I’ll double check them next time I get it out. Thanks for your input!